You're working with your computer and a notification pops up on your screen. The little box rises to tell you about a calendar reminder, or that you have a received email message or software updates ready. We computer users have mixed feelings about those Windows notifications. On one hand, they can bring information to keep you productive. On the other hand, their arrival often can be distracting, and sometimes they disappear before we can read or act on its information. 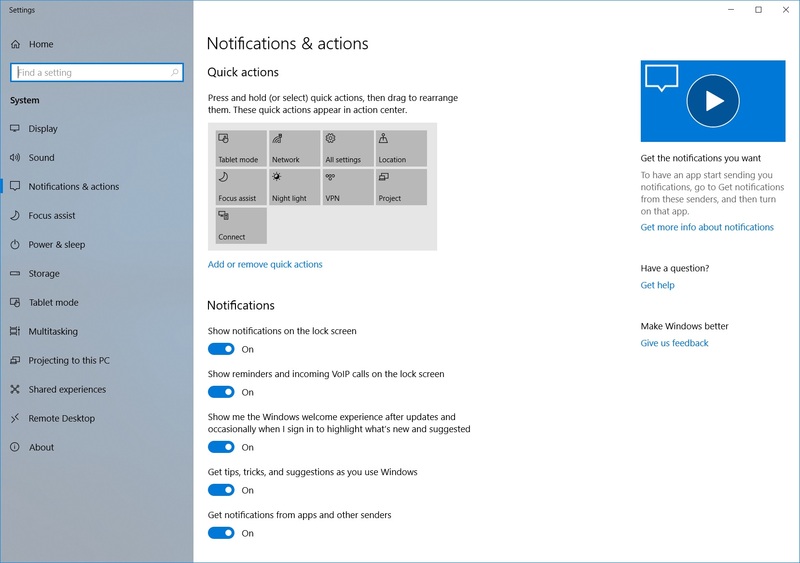 The action center in Windows 10 gives you one location to more easily manage and respond to your notifications. The action center collects notifications and alerts that come to you, so you can find them at a time when you can give them appropriate attention. 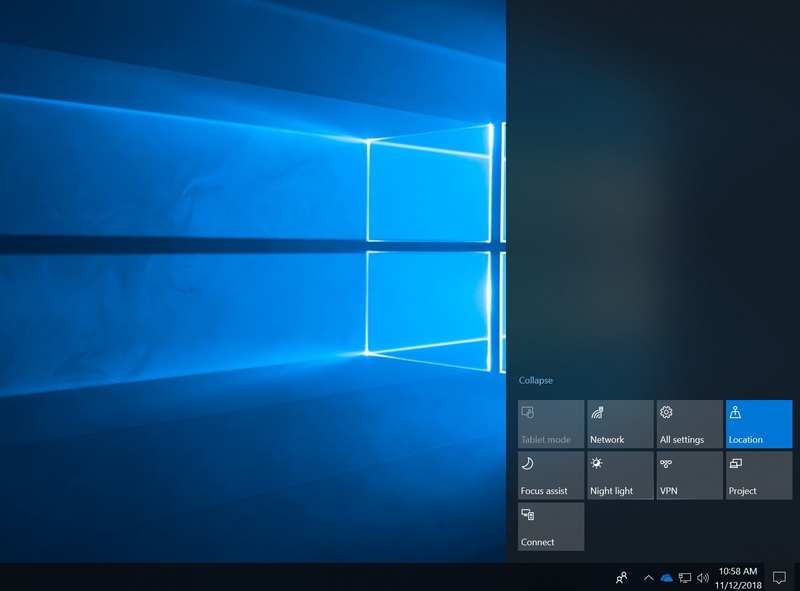 This is a great way to be more productive and efficient when using Windows, as you can quickly catch up on items you may have missed and act on them. The action center also lets you turn some settings on or off in one quick stop. Let's walk through how to set up and work with the action center to best help you get information that’s important to you. Open the action center with the action center icon at the bottom right-hand side of your taskbar. The icon as a white outline means no notifications are waiting for you, while a full white icon indicates the action center has pending items for you. Click the icon to open action center for a view of all your notifications, new or old. 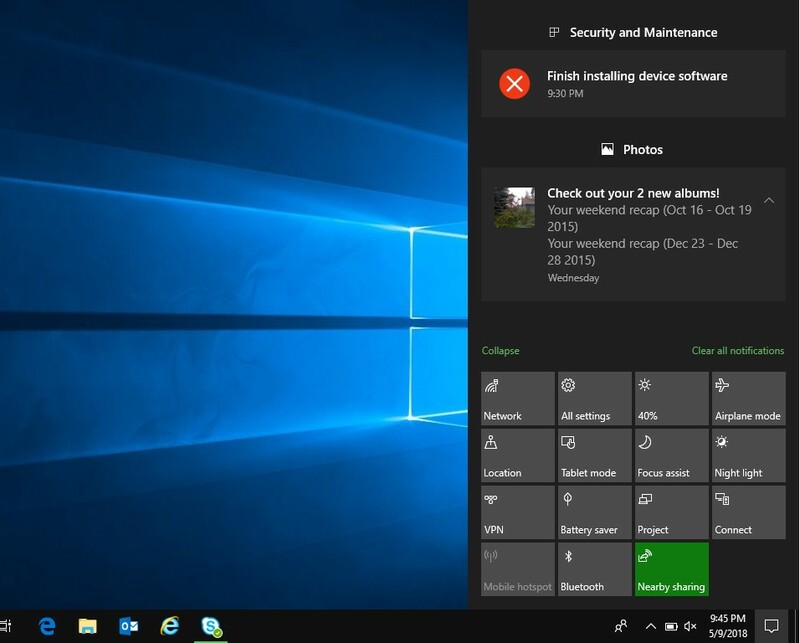 The notifications are categorized according to the application that sent them – for example, notifications from Mail are in one group, those from Windows Defender are grouped separately, those from Cortana in another group, and so on. Some may come with specific actions you can take. Otherwise, in action center you can dismiss or reply to any notification, or block that application from sending you any more notifications. If you don’t want the distraction of notifications popping up on your screen, you can stop that from happening, or even turn off notifications from a particular app. Do this with the Notifications & actions setting. In the search box at the bottom left of your screen, type in “notifications” and select Notifications & actions or select the Settings app from the Start button and to go to System > Notifications & actions. 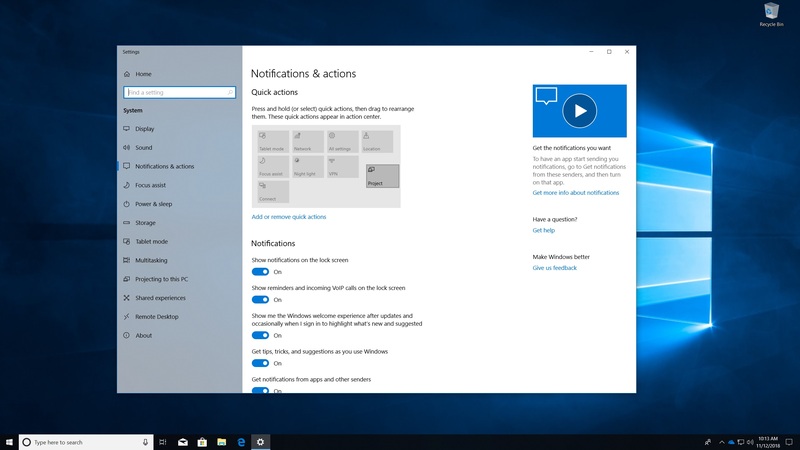 Under the Notifications heading, you can choose whether notifications can pop up on your screen while you’re working, or on the lock screen (where you sign in to your computer) when you’re not, and more. 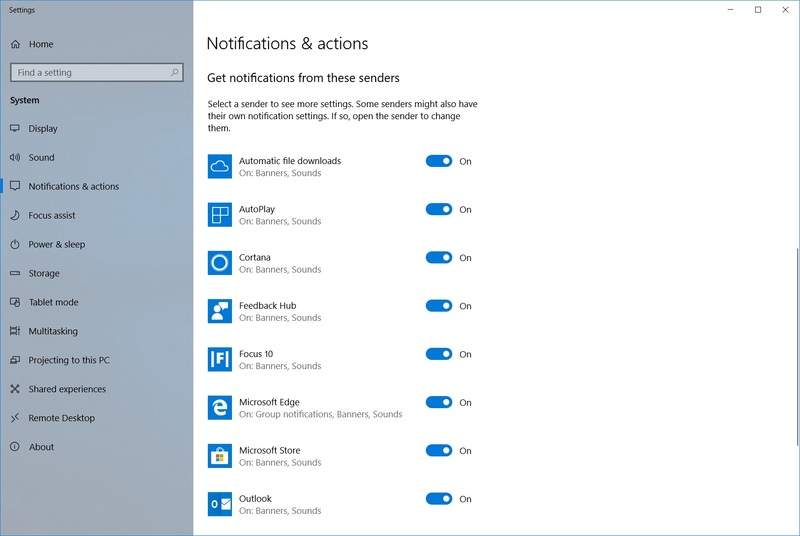 Note that even if you turn these off, the notifications will still appear for you in the action center. If you scroll down to the Get notifications from these senders heading, you can choose to stop particular apps from sending you any more notifications. Alternatively, enable Focus Assist for distraction-free work time. This screen shows you which applications can send notifications – those switched On will send you notifications as needed. To stop an app from sending you any more notifications, turn its switch to Off. This will stop any notifications from this app from appearing in your action center. The action center also gives you access to some settings that you can turn on or off there. Called quick actions, these are at the bottom of the action center. I usually manage features like connecting to a network, Bluetooth, and Night light all through quick actions. These actions are customizable, so if there are some features you may not use, or if you simply want to re-arrange them, you can do so. To start managing your quick actions, go to the Notifications & actions screen and look under the Quick actions heading. To customize these quick actions, look under the box of quick actions and click Add or remove quick actions. Then turn On the switch to the actions you want on your action center and Off the switch to actions you don’t want. Then, go back to the Notification & actions screen. Under Quick actions, to re-arrange the actions to the order you want, simply click and drag them around the box. Once you have your chosen quick actions in order, open your action center any time you want to toggle one of them on or off! With these tips in mind, it’s now your turn to set up your Action center just the way you want it! Change your quick actions, setup and start managing your notifications today.